New D’z Garage Racing Cafe in Gunma, Anybody been there? wow looks like a really cool place! Any one who lives in japan who can tell us how to go there using public transport? can I reach this by train? Anyone who lives in Japan who can tell us how to go there using public transport? Can I reach this by train? Can you visit Mount Haruna / Lake Haruna with public transportation? Is there a list of adresses of famous Initial D places? This guy found the tofu store, has anybody the adress for it? Tofu Shop's not there anymore. 5km isn't that bad of a walk. AAA can make you a ridiculously kindergarten craft looking "International Driving Permit" That works in lieu of your license. 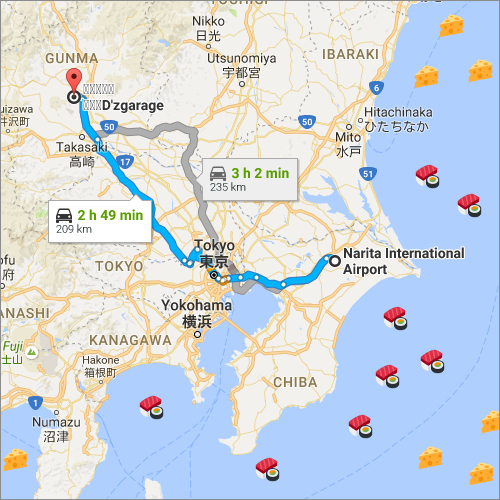 If you absolutely must take public transit to and around Haruna: http://www.japan-guide.com/e/e7480.html. Hope you speak and read a minimal level of Japanese to find some lodging if you get lost or stuck out there. Otherwise there's onsen resorts around the area but they can be pricy. If you go for anything at least go experience an onsen instead ofl just Car tour stuff. From experience- if you really want to do Initial D tour, just rent a car for the day. It makes getting around Gunma so much easier and getting to the turn offs easy for photos and taking in the sights. Otherwise you're on a bus and your view and stops are limited. Obviously don't be a hoon. You're there to sightsee, not act like a criminal. I had this posted on the facebook group page many moons ago and a certain site owner decided against promoting it (or, more probable, he's just lazy). I think Perry is busy posting 3Pac videos and highly illegal relevant xiao karaoke Sentra skits on FB ~ instead of well... y'know actual Initial D content? ...come to think of it ~ Perry's brain is even more complex than a Rubix Cube ~ he's probably working for Google/Baidu & won't even tell us !! Last week I've been to the cafe, it is still there and it is great! I visited by public transportation and even got to lake haruna / akina. I just back from D'z Garage last week, nice place ! I swear, next time I go to Japan I'm doing the pilgrimage, and I have to see that cafe. Nice to see a Cosmo there too.